In July of 2015, I finally made the decision to start my weight loss and fitness journey for two specific reasons. First, I could no longer stand feeling so sick and tired all the time. Every morning I would wake up and feel awful, I’d be sweaty, bloated, gassy and/or constipated. Some days I would have acid reflux and was even throwing up quite often. Second, “MY WHY”, my precious granddaughter, Madi, who came into this world on July 28th of 2014. Madi is just over a year old, she is my pride and joy with a spunky personality much like her father. I knew there was no way I could keep up with Madi as she began to grow, I could barely walk up a flight of stairs let alone chase around a toddler. I want to be a part of her life for a long time and starting this journey has given me the physical strength to be there for Madi and my son as he goes through this amazing journey of raising this beautiful little girl. At the onset of my journey in July I started cutting back on foods that I felt were adding to my misery and had lost 8 pounds by the time I came to Brien Shamp’s FBBC in September. When I first called Brien, I really had NO idea what to expect; I mean I had been what is considered morbidly obese for 3 years, had become obese more than 9 years ago and I had not exercised on any regular basis since the late 80’s. My official start with the FBBC was with the 21-day detox on September 14, 2015. It was a total and complete change to my way of eating and was very challenging. It took me a little while to figure out where to shop and what to prepare. Thankfully, Brien had provided recipes, information and encouragement to get through this transition. I immediately noticed the difference in the way I felt in the mornings and in my sleep patterns. I slowly began getting used to my new way of eating and felt so much better mentally and physically. Then I began losing weight as well and that was a great benefit. One of the best parts of the detox was the education about how often to eat and what things to eat and what to combine together to keep my body nourished. The crazy thing is that I have come to realize that part of the reason I had gotten so heavy is that I wasn’t eating enough of the right foods. showing up to class and trying my best. I realized that with consistency, patience and determination, and the workout modifications that were available to get through the exercises I have become stronger and stronger every day. I am now able to do a majority of the class with little modification. Brien’s help and guidance kept me determined to keep showing up for class, as well as, the positive environment, support and inspiration of the other boot camp members. Throughout this time of working with Brien and the other trainers at the FBBC, I have transformed many areas of my life, I have gained so much knowledge about my health and nutrition; such as the major importance of serving size, eating often, what types of food to eat and what to combine together and what NOT to eat. I’ve learned the importance of sleep and rest and the value of physical fitness. The exercise fitness community has taught me about teamwork, and inspiration and how vital their support has been to my success and well-being. To date I’ve lost 19 1/2 more pounds since October 4, 2015 (a total of 33 1/2 pounds) and almost 3 clothing sizes and I feel confident, strong and more fit and healthy each day. I am grateful to Brien for believing in me, for his encouragement and dedication to my success. 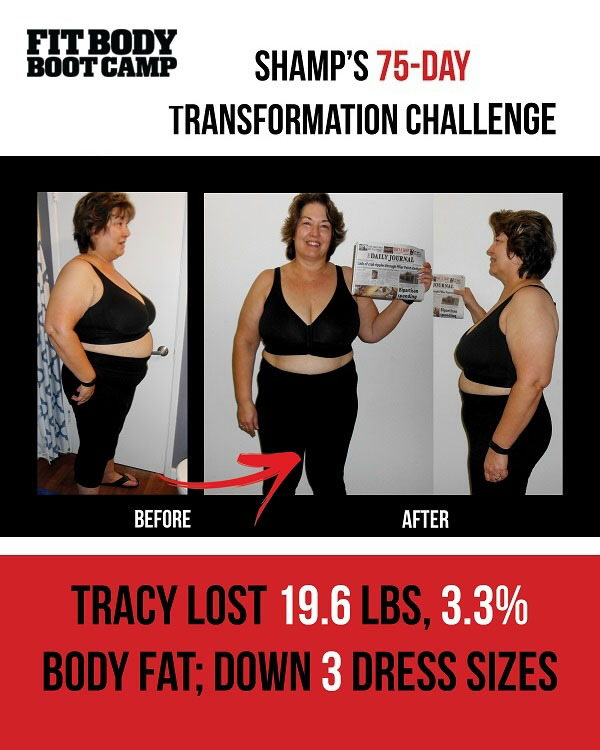 I am thankful for this program designed to help people like me who have struggled with obesity a majority of their life. Since coming to this program, I have a new sense of living, a fierce determination to go the distance, courage and more important I have learned to love myself. Yes, I have lost weight, body fat, inches, but the irony is what I have gained is what will continue to transform my life forever!